A few years ago, a client of mine visited us for a series of meetings. He asked for a restaurant recommendation, and I suggested The Gandy Dancer, my favorite restaurant. The very next day he came to my office and raved about the restaurant. He was going to recommend it to every one of his colleagues. That is how many of us believers live our lives. We read the menu and miss the meal. It’s as though we’ve come to believe that Christianity—boiled down to its core essence—is an abstract impersonal menu of truths. But it isn’t; and that mistake leads to a bland, malnourished, and starving life. As an example, let’s examine the doctrine of Justification by Faith. 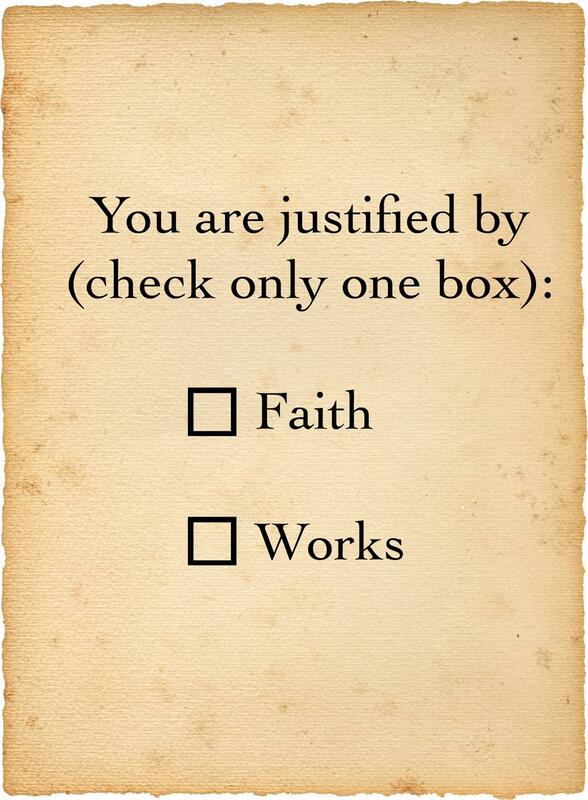 Most Christians believe that we are justified by faith and not by works. I do too. Unfortunately, most teaching focuses on the theological concept of Justification by Faith. It doesn’t teach us how to live a life of Justification by Faith. We are reading the menu and missing the meal. The Incarnation of the Son of God, the earthly ministry and teaching of Jesus, the suffering and death of the Messiah, and the resurrection of the Son of Man; they all boil down to this moment. Which box will we check? The hosts of heaven wait in anticipation. All the disciples are there; the martyrs watch; the angels, the seraphim and cherubim all wait with hushed eagerness. Will we check the right box, or will we be chopped? Is this the essence of Christianity? Does it all boil down to an impersonal, abstract, dry, lifeless question on a test? Justification by Faith is an invitation to a feast. When Christ promises abundant life, he offers more than an extension of life in the hereafter; he offers a richness of life of living in a reality that is deep, fulfilling, and abundant. Now. That is Justification by Faith. Do you see where I’m going? Are we content with the correct cerebral concept; or are we operating in the personal lived-in reality of the truth. Are we chewing on the menu or feasting on the meal? Eric Liddle feasts on the satisfying reality of experiencing Christ’s love; Harold Abrams hungrily grasps for his life’s justification. Like Harold Abrams, we are justifying ourselves. In fact, when we justify ourselves by our checking Justification by “Faith,” it is a type of justification by works; the “work” is our theological correctness. Acknowledging the correct answer—Justification by Faith—is not the same thing as the state of being justified by Faith. I suspect even Satan could check the right box. Remember when our mothers wouldn’t let us eat cookies before dinner because it spoiled our appetite? It’s because the cookies give a sugar high which temporarily masks our hunger, so we miss the good nutrition from the meal. Likewise, our self-justifying actions temporarily satisfy us, but they nourish no long-term soul satisfaction. We need to starve our self-justifying habits. Ultimately, though, we need to ask God for a deep heart sense of his reality in our lives. When we sense his greatness in our hearts, and when we come to experience his deep love for us, then we begin to live a life that is Justified by Faith. That is what we need, his living, bright reality. A meal that finally satisfies. Wow Sam, well said. Justifying ourselves by just agreeing we are justified by faith – I’m guilty. For some reason, this is an ongoing struggle, and gives others a skewed view of the real, authentic core of Christianity. I want to daily live out the real deal but there are a lot of days it just doesn’t happen. Hey, don’t I know it! The problem isn’t “proper theology” — we have to begin there. The problem is when we no longer “wonder” at theology. In fact, I sometime wonder if we don’t live in a heretical world of “wonderless” theology. Any theology that merely addresses cerebral understanding–how many angels can dance on the head of a pin?–is missing the mark. Truth is meant to pierce our hearts. I think it is supposed to make us “wonder” in awe, like a kid who sees her first giraffe. It’s too cool for words. I don’t want to live an ordinary life, striving for success as society offers it. I want to live freely and live into what God has already designed in me. Sam, I came across this and it reflects a memory of a line a Vineyard (Santa Monica, CA) pastor used to say back in the mid 80’s. He’d call Biblical legalism/religiosity “Eating the menu.” I don’t know if he made it up, but it is a great line. It ocurred to me that although I sometimes get a taste for the menu, at least there are a few tidbits of spilled food on most menus…not exactly zero calories. I eventually get around to ordering and eating the bread of life.